White, blue, orange & yellow graphics. 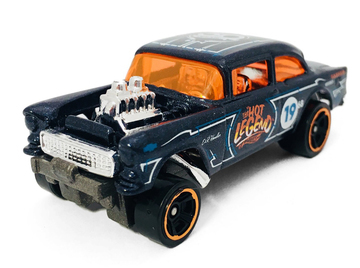 "The 'Hot Legend' of Hot Wheels" on doors. "E & R Handler,"Vetuskey,", "Gasser" on sides. 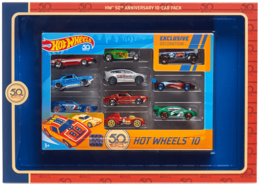 Large "19" & small "68," 50th Anniversary Hot Wheels logo & Chevy Bowtite on sides. Large 50th Anniversary Hot Wheels logo on roof. Blue & white pinstripes on sides, roof & trunk.